Earlier in the week, ComicsAlliance announced that Marvel has provided us with an early look at the variant covers for issues 2-5 of the new 'FF' series from Matt Fraction and Mike Allred, launching in November as part of the publisher's Marvel NOW initiative. Each cover, drawn by Allred, showcases one of the new members of the FF. When put together, they form one image of the entire team. Monday we showed you the Ant-Man cover, Tuesday the spotlight was on Medusa, and yesterday we gave you a glimpse of Miss Thing. The final variant, for issue #5, puts the spotlight on She-Hulk. Check out the full image, and what all the covers look like when put together, after the cut! 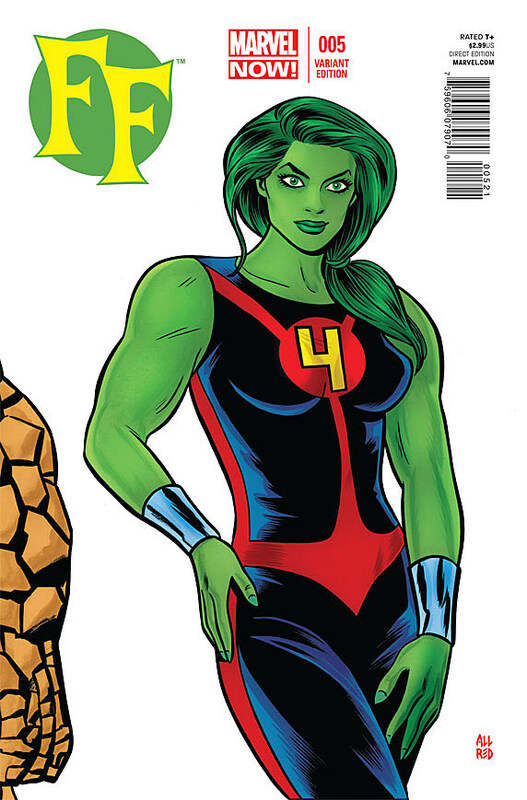 Having once taken The Thing's place on the Fantastic Four during John Byrne's legendary run on the series, She-Hulk has a long history with the team. Ben chooses her to take his spot on this new version of the Future Foundation because she's "the one person he knew he could never lick," according to series writer Fraction. That's it for the variants, but take a look below to see the entire team together!